Starting out as a Health Coach? You’ve chosen to become a Health Coach because you’re super passionate about sharing with clients everything you know about healing their bodies naturally, right? But where do you start? Where will that first client come from, and what steps do you need to take to start up a Health Coaching business? And a successful one, at that! You've seen Health Coaches doing it, their lives look great and so can yours. You can make a fantastic living doing this! But you do need to know the steps to take because what you see other Health Coaches doing online is only the tip of the iceberg - the pretty polished finished picture on the surface; but their real secret is in knowing what it takes 'behind-the-scenes'. I'm going to show you exactly how they do it so you can experience that level of success, too. Why do Health Coaches need their own program? As you've probably begun to suspect, selling Health Coaching services is different to selling anything else. How do you get past the client's doubts that they'll follow through? How do you sell without promising results that just CAN'T be guaranteed? How do you fill the client with inspiration and sell them what you KNOW they need when they are bound to be skeptical? My system deals with all of that. I've had many 'NO's myself. I've learnt the art of getting past the 'NO'. That is a big part of this program - along with how to make yourself visible and known as a 'go-to' face in your field. You may already have your certification, but there's a big part that isn't covered yet. And this is going to come from the mindset skills and coaching skills that I teach you to massively up your confidence as a Health Coach, and help you get those results for your clients that you might be afraid you won't get. My simple new UPSwing Client Kickstart eCourse walks you through exactly what to do, step by step, to fill your Health Coaching practice, even if you’re new in business, or have never had a client. I'm Amanda Jane Daley. I've helped some of the most successful Health Coaches you know - they've quit their jobs, travelled the world while coaching, booked-out their schedules solid (with growing wait lists) and are making incomes of $5-10k per month. Until now I've only been able to offer that to my high-level UPswing Mastermind clients, but now I am so excited to offer you a 'kickstart' system to get started using exactly the same foundations. I will take you by the hand and help you build the energising, personally fulfilling, profitable health coaching business that makes a difference not only to your quality of life, but also to the wonderful clients who are waiting for your services. Let me empower you with the tools to kickstart this rewarding and flexible career; to help others and get paid what you deserve. Discover, step-by-step, how to go from where you are now to getting your first Health Coaching client, and from there scaling up to the $5k month income level and beyond. No more wondering where to begin. No more lying awake pondering how you’re going to ever make a substantial living doing what you’ve been called to do. "Do I have to do webinars?" "Aren't there already too many Health Coaches?" "Are there enough clients to go around?" "Does anybody actually want to buy Health Coaching?" 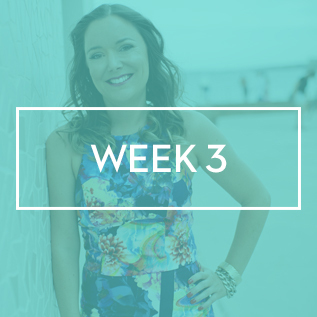 I'm going to walk you step-by-step through everything you need to know so that by the end of the 6 week program you are ready to hit the ground running and get your first Health Coaching client! Imagine how great you will feel when you get super-clear on your personal brand, target market and signature packages. You’ll totally forget those old worries about whether there is room for you in the marketplace and whether you can really get results for your clients. Imagine a fully-booked schedule of clients and knowing exactly where to find more at anytime. It's never going to dry up if you know these steps. Imagine knowing how to sign up clients with soul, not sleaze, and how to confidently conduct your coaching sessions. Imagine knowing the exact formula to make $5k per month (or more) in your first year as a Health Coach - building not only the income you desire, but also having plenty of time for that yoga class, a green smoothie with friends, and date nights with your man. The underlying secret behind creating ALL of this is that when your business is built to fuel you, you will in turn fuel a powerful Health Coaching brand that is untouchable. That's exactly what I am going to help you do! I spent my first career in advertising, working with some of the most iconic brands of our time, including Coca Cola, Microsoft, Nokia and eBay. But advertising is stressful. I found myself tired all the time, getting sick far too often, and watching my productivity drastically drop away – and, as you're a Health Coach, you probably guessed - I got diagnosed with stage 3 adrenal fatigue, which finally made me choose to step aside from the career I had built over 15 years. I set about learning all about health myself - studying to be a Health Coach as part of that process. When I first left advertising to become a Health Coach, I truly had no idea how to go about getting clients. I was bewildered and unsure how I was going to make it work. In the first 6 months I had only 2 clients and had made no money (yes, I gave those first 2 away for free). After that initial false start, and the shock of how hard it really was to get clients as a Health Coach (followed by months on the sofa wishing I knew what to do to get things rolling), I was struck with an idea. I could blend my old career with my new one and I could use the marketing strategies I knew like the back of my hand to go out there and get my Health Coach on! In no time I was consistently reaching $5k months, often more. I was fully booked with Health Coaching clients, I was hosting workshops, speaking at events, launching eBooks and my Driven Woman's Detox Program. As I started succeeding, people started coming to me wanting to work with me and wanting to know about my new career, and I realised there really was no lack of clients needing a Health Coach. There is no end of people wanting help with their health! I wanted to show other Health Coaches the opportunities that are out there once you know how to tap into this bottomless, endless goldmine. There is truly no limit to how many new Health Coaches can come into this marketplace! And yet so many new Health Coaches are still stuck and frustrated at not getting any clients - simply because they do not know how to make this work. The schools just don't teach this. I want this for you. I sincerely believe that every Health Coach has the ability to create a successful business with dream clients when armed with the right tools. I believe you have a message to share with the world which is far too important to be left unheard. And I believe that the world has the chance to truly value their health, when we as Health Coaches get our messages out there!! One day it hit me - I could make a WAY bigger difference to the way the world receives Health Coaching if I shared my marketing knowledge with the many other Health Coaches who didn't know how to do it. To fill this missing gap of knowledge in the industry, I started mentoring new Health Coaches to get their first clients and build a thriving business. And, after realising that everyone had exactly the same questions, I went on to create my signature program, the UPswing Mastermind. The Upswing Mastermind has now seen over 100 Health Coaches graduate - many now running businesses which bring in a consistent $5-10k a month. My signature 6 month mastermind program, which sells out very quickly, has a very high-level of my personal attention and is an investment of both time and money. And I totally understand that not all new coaches are ready for such an investment. I'm thrilled that I've now been able to distill the foundations of my UPswing Mastermind into an online course so that people of all stages can kickstart their Health Coaching business right away and get their first clients. 6 weeks online, packed with easy to follow, easy to finish, engaging video training! Each week there’s a detailed workbook to guide you deeper through each process. Nothing will feel overwhelming. You'll be amazed at the clarity, inspiration and aha's that come from the clarity of implementing these worksheets. On top of this, YOU’RE GETTING MY 15 YEARS OF EXPERIENCE IN MARKETING AND RUNNING A SUCCESSFUL HEALTH COACHING BUSINESS, lovingly crafted into something that will take your Health Coaching business to the next level in just 6 weeks! You'll never have to say you're an 'Aspiring Health Coach' ever again. I can safely say that this course is what you’ve been looking for if you are ready to go out into the world and share your tools and knowledge with people you KNOW need a Health Coach like you. Are you ready to become the Health Coach you've been dreaming of? I believe in this course so strongly, as I have seen it grow so many coaches’ businesses into thriving successes – and it is jam-packed with awesome value. If, for any reason, you work through the first two modules of the course (the first 14 days) and are not totally happy, I will refund your enrolment cost (minus a 10% admin fee to cover course administration). I offer this guarantee because I have complete faith in this program, and I know that if you commit to doing the work, taking action, and taking personal responsibility for your own business, then you will have everything you need to kickstart your Health Coaching business. Due to the nature of this kickstart course being 6 weeks, there should be no expectation of overnight success, as implementation takes time. You will have everything you need to get started, and if you’re prepared to commit to the learning process and immerse yourself in these strategies consistently, it is possible to achieve far and beyond a return on your investment. In short, this course works. What you do with it, however, is always up to you. ‘Change of mind’ refunds are not permitted in any circumstance. To qualify for a refund, you must demonstrate that you have participated in the course before requesting a refund and you’ll be asked to hand in all completed work that has been required in the first 2 modules. Refunds must be requested in writing to support@amandajdaley.com within 14 days of purchasing the course to be eligible. I don't even have ONE client yet, will the course help? The UPswing Client Kickstart eCourse was created for women just like you. You’ll learn where to go to find your first client (and many more), and you’ll discover the effective strategies I used to grow my client base from scratch. Everybody has to start from zero. This course is equally beneficial for coaches who may have had a few clients but are wondering why they aren't getting the consistency they desire. I don't have any experience, so I'm nervous to call myself a Health Coach. Is this the right course for me? Confidence is one of the biggest issues amongst new health coaches and is completely normal. Joining a group program like this will instantly connect you with others in the same boat which will help you to understand it is not 'personal', but rather a skillset you are currently missing of how to run an effective coaching business. The UPswing Client Kickstart eCourse is designed to walk you step-by-step through the process of starting your business - from scratch - and has a large emphasis on building confidence and feeling more expert in your sales calls, coaching sessions and marketing. I'm terrified of selling. I don't want to go all 'salesy' on people. Will the course cover that? No-one wants to feel swarmy or sleezy when selling their coaching program to a potential client, and yet what most new coaches don't realise is that a soulful sales process is normally actually a healing experience. This course teaches a soulful selling approach unlike those taught directly from the health and nutrition schools and for many of my clients, this lesson alone has been THE game-changer. I was planning to do the next UPswing Mastermind, should I join this course instead? What is the difference between UPswing Mastermind and this eCourse? UPswing Mastermind is the ultimate 6 month journey to building your coaching business. The mastermind has a very high level of personal attention from Amanda, via live training sessions, live laser coaching sessions, Facebook qa sessions and 24/7 Facebook masterminding for a committed 6 months. It is an investment of both time and money - and has a reputation for stellar results. UPswing Client Kickstart eCourse can be seen as the little sister in the family. We cover the same foundation and UPswing signature system in a lighter way. There are 6 weekly modules which you can do at your own pace - take it as quick or slow as you desire. It has a low accessible investment to allow everyone to get in the game now, regardless of whether you are already making money from your business. The eCourse is ideal for those wanting to dip their toe in the UPswing experience or for those looking for something to kickstart their journey at their own pace. I'm still training to be a Health Coach, is it too early to sign up? UPswing Client Kickstart covers business topics beyond what it is taught at any of the schools and is therefore a great compliment to any nutrition or health coaching program. It can be taken at any time during your training (or after). You will just want to follow your school's advise on when you are able to start taking on clients. If you are already able to take on clients, get onto this straight away - don't waste your valuable time trying to piece it all together yourself - we've done that part for you. I continue to follow this exact system today in my own business to create a high 6 figures p/y income. "I definitely would (and already have) recommended Client Kickstart as a fast and effective way to "get in the game", getting the hang of the basics of the business part, ways to be seen and how to charge as a Health Coach." "I wanted to send you a quick message to say a HUGE thank you to you for your 6 week UPswing Client Kickstart. The amount of 'A-HA' moments has been astounding. There have been tears, realisations and some serious soul searching. Thank you for sharing your gift with the world. I know that through completing this course I will be the best possible health coach I can be and that I will be able to go out and make a difference in peoples lives. Thank you." "Even though we have never met, or even spoken, I feel like we know each other. I think it comes down to your genuine need to help. I have really enjoyed the course so far. I was so close to just giving up!!! And now, quite the opposite actually and super excited about my new program and future life. THANK YOU for giving me hope, guidance and confidence that I CAN DO THIS!!!!" "Before the UpSwing Client Kickstart I felt unsure and lost in how to run a Health Coaching Business. The program has given me so much clarity in the areas needed to run a successful coaching business - from becoming clear on my target market to discovery sessions with clients. Amanda walks you through step by step all you need to know when starting out as a coach and a business entrepreneur. My mindset has shifted around marketing and sales too and I now feel confident in what I need to do on a daily basis which is such a relief. I would highly recommend this program to anyone starting out as a coach and entrepreneur." "The Upswing Client Kickstart has been a fantastic and fulfilling six weeks of learning and exploration. I feel so much more confident and ready to go out and get my business truly achieving what I know it can. Amanda's guidance is clear, actionable, and totally relevant for health coaches, and spoke directly to my concerns and situation. In just six weeks I've gone from nothing to having a clear target market, a well-planned coaching package, knowledge of how to market it, AND new discovery sessions coming in each week. I've loved the entire program and feel like Amanda really delivered value above and beyond anything I was expecting. If you're a health coach struggling to set up shop and unsure why you're not getting anywhere, give this course a try - I am so happy I did!" "Amanda taught me exactly how to determine who I serve and how I serve them. I also learned how to find my ideal clients and sign them to my program. It's been an incredible journey that's landed me more clients and more income than I've ever had as a health coach. I finally feel confident in my role and like I've stepped fully into my career as a Health Coach."